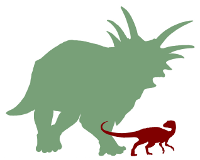 The ODP (Open Dinosaur Project) is a collaborative research effort, focused on developing a comprehensive database of limb bone measurements for dinosaurs. By collaborative, we truly mean it – anyone is allowed to contribute to the database. We will focus on measurements in the literature as well as “original” measurements taken directly from specimens. For Phase I of the project, we will use the data to look at patterns of limb bone evolution in ornithischian dinosaurs, and how it relates to the evolution of locomotion in this group. Preliminary results and analyses will be blogged at this website, and all participants will be included as junior authors on the resulting scientific paper, unless they request otherwise. I’m not a professional paleontologist. Can I participate? Absolutely! In fact, we strongly encourage you to join us. This project is all about participation of everyone in the process of science. All contributors–whether high school students, scientists with Ph.D’s, school teachers, plumbers, whoever–will share in the credit and responsibility. You may not be a professional, but you can conduct yourself like one, and by doing so make a legitimate contribution. We aim to finish data collection by 1 February 2010, finish data analysis and begin writing the paper by 1 March 2010, and submit the paper for peer review by 1 April 2010. May I use the data for my own research? Yes, you may – although we ask that you hold off on publication of any results until we have had a chance to complete the initial publication of our own study. The reason for this is that we feel it is important for our volunteers and project leaders to get their chance at the rewards of this project (which have very real implications for tenure, promotion, graduate school admission, etc.) without being scooped. Once we have published the initial results, all of the data incorporated into the study are completely fair game. Also, we would love to know if you are using the database for your own research – it makes us happy to know that others find it useful! How will authorship on the resulting paper be organized? The senior author will be Andy Farke, followed by Mike Taylor and Matt Wedel. All other authors (i.e., all those who contribute data to the database) will follow alphabetically. Farke, Taylor, and Wedel are designated the top three authors because they have expended / are anticipated to expend the bulk of the intellectual and logistic effort behind this project. In the event of misconduct, misrepresentation, fraud, plagiarism, or other problems identified by the project leaders, the project leaders reserve the right to remove someone from the authorship list. In the extremely unlikely event that a new taxon is “discovered” by us (Farke, Wedel, or Taylor) during data collection, we reserve the right to publish this as a separate paper or taxonomic note within the larger paper with a much smaller author list. The reasoning behind this is to spare the world a taxon with 84 authors (a true pain for any future workers trying to address dinosaur taxonomy!). But I think I should rank higher in the author order! Didn’t I contribute 10 times more entries than ______? We sympathize, but in order to be fair to everyone we are not prepared or willing to make this sort of call at present. Besides – in a paper cited as “Farke et al.,” everyone after first author gets equally short shrift. May I opt out of authorship? Yes, you may opt out of authorship at any time (up to submission of the paper), for any reason. We will not add anyone to the author list without his or her approval. Am I guaranteed authorship on future papers resulting from the database? Beyond the initial paper, you are not. If we have subsequent papers resulting from the database, we will notify contributors as appropriate if we decide to open up authorship. Can I use my on-line handle for the project? No. Although we appreciate and understand the use of nicknames and handles on the blogosphere, message boards, and other forums, an important aspect of science is personal accountability. If we’re going to do real science, we need to have our real names on the data and on the papers. Although not everyone on the project is a professional paleontologist, we expect everyone to conduct themselves professionally. What unit should I enter measurements in? Where can I find articles with dinosaur bone measurements? Fortunately, this is much easier than it used to be. Recognizing that not everyone has access to a giant library, or even a giant PDF library, we recommend you check out our list of open access paleontology journals. Also, many non-open journals (such as Nature) often have supplementary on-line information that contains measurements and is also freely available to the public. Can you send me PDF’s or photocopies of papers I can’t find on-line? Due to personal time constraints as well as the necessities of copyright law, we regret that we cannot fulfill requests for PDF’s. Really, we would like to be able to do this! Why just ornithischians? I’m more interested in theropds! Because this is very much an experimental project, we feel that it’s best to deal with a constrained group at present. Theropods and other clades may well be in the future of the project – but for now, we need to focus our efforts in a realistic fashion. Research-wise, ornithischians are most interesting for their multiple transitions to quadrupedality. Theropods – not as much. That said, we do welcome the input of measurements from other clades (e.g., theropods and sauropods). Just be aware that the data will not likely be used in the immediate future. I have unpublished measurements taken from museum specimens. Are they welcome in the database? Why do you require entry of published data by two separate users? Accuracy of the data is key for ensuring that our efforts are scientifically valid and useable by other researchers. Yet, everyone (even–or perhaps especially–the project leaders) makes mistakes. It’s very easy to misread a number or transpose a column from a table. So, we have developed this system to ensure that the data are double-checked for accuracy. Why aren’t my full data entries immediately visible until someone else enters the same data? pasting measurements and saying that they have double-checked the data. Where will this research be published? Will the draft version of the resulting paper be freely available on the Internet prior to publication? Contrary to what we may have said earlier, the answer is yes. How does this project differ from the Paleobiology Database (PBDB)? Like the PBDB–another wonderful example of a freely available database for paleontologists–our data are open to the world. Our main difference is that the ODP is not just an open data repository, but an open research project. Research questions, hypotheses, and results will all be transparent. Furthermore, no specific scientific qualifications, affiliations, or recommendations are necessary to participate in the ODP. On a grosser level, our project is less concerned with collecting information on spatio-temporal patterns of biodiversity, and more concerned with collecting morphometric data. We do not consider ourselves to be in competition with PBDB, but rather to be complementary. Yes, perhaps. Opening up data collection and the research process is a radical thing for any science, let alone paleontology. Because this is very much an experiment in science and the internet, we anticipate that there will be occasional mis-steps and misunderstandings. Bear with us as we all learn together! All members of this project are pioneers–and we are optimistic that we are leading the way for others. I already have a project like this in the works and I’m freaked out that you guys are doing this and I wish you’d stop. Great, best of luck with your project. We don’t see any reason why you ought to be threatened by our work or vice versa. Odds are quite good that we are working or thinking about different angles of the issue, which is never a bad thing. So are you suggesting that every researcher should open up their notebooks? No, we are not. Some projects lend themselves better to this format than others. Our approach is not a “one size fits all” method, and we ourselves have plenty of “non-public” projects. What is this “open access” thing? “Open access” refers to the publication of scientific research in a way that is freely and completely available to everyone with Internet access. Email Andy Farke (andrew.farke@gmail.com) if you have any particular questions or concerns, and he will do his best to help you out. This suggestion is probably WAY out there, but I was reading about Effigia and “extreme convergent evolution,” and I wondered if you might benefit from taking some aetosaurs (like Desmatosuchus) and comparing them to somebody like Euparkeria, and then compare ankylosaurs to Eoraptor the same way. Hmm. . .that sounds like an interesting side project. I would certainly not discourage you from submitting these data, although at present it’s outside our main focus (ornithischian limb bone evolution). That said, it *would* be really cool to look at morphological convergences in archosaur limbs. Maybe this is a good idea for a future phase of the ODP. . .definitely let’s keep thinking and talking about this one. We welcome your collaboration! Right now the main thing is getting limb bone measurements entered/verified in the database. Please let me know if you have any questions. Welcome to the ODP!